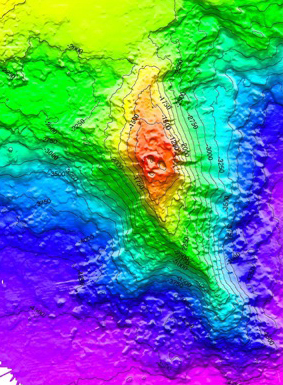 Loihi Seamount with a summit depth at ~1000 m below the sea surface is a seismically active submarine volcano, representing a yet to emerge Hawaiian island. Although not volcanically active at this moment, Loihi is characterized by active hydrothermal venting that supports a microbial food web dependent on the oxidation of Fe, which is available and plentiful in the basalts of the volcanic substrate. 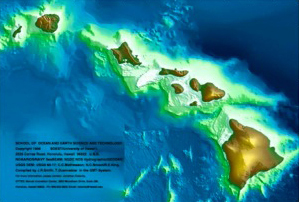 The Loihi Seamount (summit at ~1000 m below surface) is a seismically active submarine volcano that represents an emerging Hawaiian island. Following several studies in the late 1980's that predicted hydrothermal venting based on enrichments of various gases and metals in the water column over Loihi, two hydrothermal fields were discovered by Dave Karl and colleagues. Since these hydrothermal fields were discovered, it has been recognized that the geochemistry and biology of Loihi render this system distinct among known deep-sea hydrothermal environments. For example, the vent fluids at Loihi are highly enriched in iron and carbon dioxide but are low in sulfide. Low oxygen and pH are important factors in supporting the high Fe concentrations, one of the hallmark geochemical features of Loihi. These chemical characteristics, manifested as gradients set up by venting fluids and weathering rocks make perfect environments for iron-oxidizing bacteria (FeOB) to thrive in. 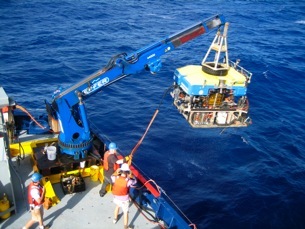 Access to FeMO at Loihi Seamount is by ship-based submarines. 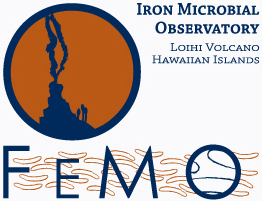 Members of the FeMO team have previously visited Loihi on the R/V Ka`imikai-o-Kanaloa (KoK) using the University of Hawaii-operated manned submersible Pisces. 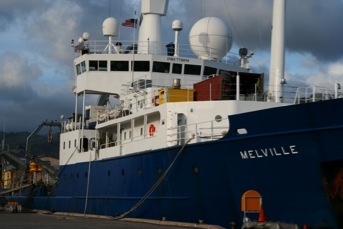 In October/November 2006, 22 scientists took the first of three yearly cruises as part of FeMO aboard the R/V Melville and our eyes and hands at the seafloor belonged to Jason II, a remotely operated vehicle (ROV). 17 FeMO PI's, post-docs, students and a teacher convened at Scripps for a two day workshop to present science, plan outreach and prepare for our cruise in October.